Actually there is no best time to visit Amsterdam. The city is one of the few destinations in the world which can be visited all year long. Every season here has something to offer to the visitors, thus beckoning them to come and experience everything which makes the capital of the Netherlands the way it is. Whole year Amsterdam provides stimulation to the brain’s pleasure center. Even in the winter! Of course, there is a peak season – it`s beginning in the last months of spring ( the tulip season) and finish at the end September. Also the city is very crowded during the school vacations in July and August. Amsterdam is very very busy at its high season, which means hotel rooms and hostel beds are hard to find and bargains don’t exist at all. Some of the photos below were made in March(before the high tourist season), the rest in October (after the season). You can see that the weather is good enough for walking, riding bicycle and siting on the benches outside, but is not that crowded like in the middle of the Summer. Also I can say that the best time to visit Amsterdam is during the winter holidays in the period between December – January. TIP: If you are planning to travel during that peak season, book your hostel in advance. In winter, hotel and hostel rates are much cheaper, the city is less crowded at all and feel more genuine. So if you want to save some money and share the hostel room with less people it`s better to visit Amsterdam during the low season. Also, visiting Amsterdam for the winter holidays will be a trip you will always remember as the craziest adventure ever happened to you. In the most visited town of the Netherlands, a wide and certainly diverse range of attractions awaits visitors: numerous cultural programmes, wonderful town squares, the Royal Palace, the Dam, the Red Light District, the canals, and, for shoppers, the Albert Cuyp Market, one of the busiest open-air markets in Europe. Not to mention the fact you need never go hungry with typical Dutch dishes and the chips and waffles on practically every street-corner. Amsterdam is a place no one can leave without feeling in some way satisfied. There are so many thing you can do during the winter in Amsterdam beside the usual city attractions. You can ice skate on the frozen canals and few other spots in the city or you can just sit on the ice and have a coffee. Isn’t it cool? 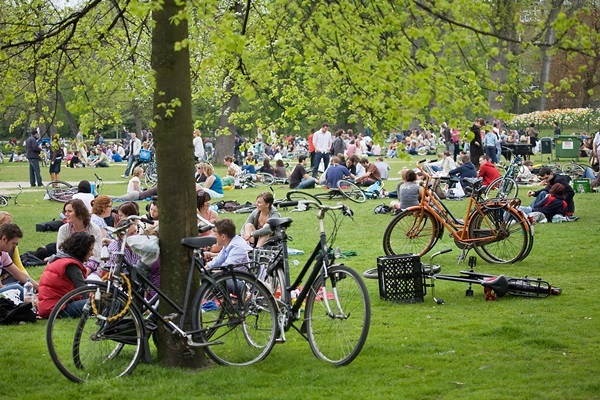 Have you ever been in Amsterdam during the low season? What are your impressions and can you give some advice for those who are planning to visit the city at this time?